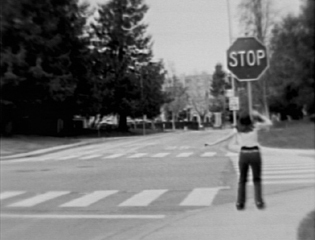 A DMI Silent Picture complete with the old movie texture, a story about a short person, a tall person, and a stop sign. A Silent Film with Inter-Titles and No Sound about two people- L.G., who only wants to be tall, and Tony, who only wants to be short. Will they get what they want? Deciding to test an opposite processing technique, I opted for a script this time since I already BS'd once, and wanted to make it worth the money. While we're waiting for "a first date" to be released, one word quickly came to mind, and the intertitles were quickly written. Initially cast with actress Laura Wenus in the role of Tony (originally Tina), but she had scheduling conflicts. Like with "N", the gender switch appeared to be beneficial, with reliable Kevin yet again on-screen. Up until the last minute before the shoot, I did not know whether the film would even be shot, so I didn't bring a shot list- quickly writing one down on the back of a store receipt and shot over an hour around Cupertino Library (with the local inhabitants, for once, accepting our filming there and getting out of the way), the best interests were in saving time and film stock, so a few cars made it into the finished product, four non-essential shots were removed from the list, and even then in the loading and unloading of the film roll, light leaked into the opening and ending shots. 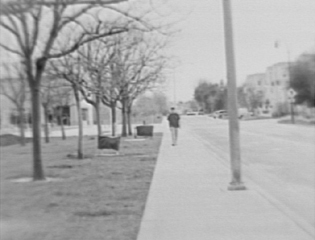 After waiting a week for the footage to come back, I watched it on the school's crappy telecine and something inside me died- it had everything to do with the picture quality. Hours later, it got edited, and released in the form you see currently. Some day it might include a musical score; I want the trumpets section, I know that much. Hope you all enjoy, and I hope it's an inspiration to all those who are unhappy with their height.